The wisdom tooth (or third molar) is usually the last tooth to erupt into the mouth anytime after about 16 years of age. Frequently there is not enough room to accommodate wisdom teeth and as such they do not come into the mouth normally. When this happens, the wisdom teeth are said to be “impacted”. Wisdom teeth are usually either impacted forwards into the tooth in front or backwards into the jaw bone. An impacted wisdom tooth can cause repeated attacks of infection in the gum surrounding the tooth, causing pain and swelling. Why do I need treatment? 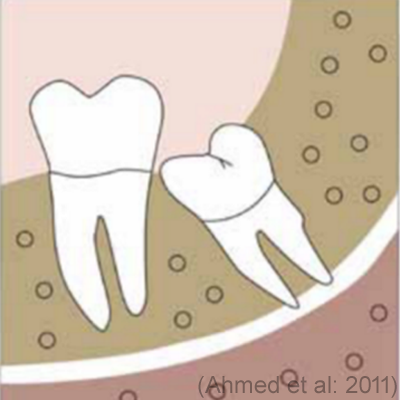 If left untreated an impacted wisdom tooth will continue to cause repeated attacks of infection and pain. Food packing can occur, which causes decay in either the wisdom tooth or tooth in front. Cysts can form around the wisdom tooth if it does not come into the mouth properly. A cyst occurs when fluid fills the sac that normally surrounds a developing wisdom tooth. The options are having no surgical treatment the tooth can be monitored by your dentist if it has not been causing significant pain or repeated infection. Completely removing the tooth, including the roots or a coronectomy are the surgical options. In the coronectomy technique the crown of the wisdom tooth is removed (decoronation) leaving the tooth roots behind in an attempt to minimise the risk of nerve damage. Why have I been offered a coronectomy as my treatment of choice? Lower wisdom teeth can lie close to the nerve inside the jawbone which supplies the feeling but not the movement to the lower lip and chin. We can see this nerve on a normal X-Ray radiograph but sometimes a special cross sectional scan called a cone beam CT is also taken to give a 3D picture of the relationship of the nerve to the tooth roots. If the roots of your lower wisdom tooth are judged to be particularly close to the adjacent sensory nerve nerves, then you may be offered a coronectomy instead of complete removal of the whole tooth. Intentionally leaving the roots behind reduces the risk of bruising or stretching of the nerve. This can significantly reduce the risk of permanent lip, chin, cheek, gums and tongue numbness or tingling that can happen after wisdom tooth removal. There are only certain situations where this procedure is recommended. If the tooth is decayed or has a nerve present which has died, the roots will not be healthy and cannot be left behind. Because the wisdom tooth has not fully erupted into the mouth, it is often necessary to make a small cut in the gum, which is then pushed back out of the way. Bone around the tooth is gently drilled away. The crown of the tooth is removed with the drill and the remaining root surface smoothed down. The gum is then put back into position and stitched into place. The procedure usually takes 30-40 minutes. What are the potential complications with coronectomy? It is possible that the wisdom tooth roots will have to be removed at the time of surgery if they are mobile. The roots may also become infected in the future and need removing. If this happens they usually rise upwards, away from the nerve, reducing the risk of numbness that may occur. Studies suggest that migration of the retained root or delayed healing happens in about 15% of cases, resulting in a need for further surgery. What are the possible problems with having operations on wisdom teeth? This is the most common side effect and usually lasts for up to 14 days. The amount of swelling varies from patient to patient. In addition to this the application of an ice pack during the first 24 hours post-operatively may help. Do not apply the ice pack directly to your skin, but wrap the ice pack in a towel first. This is a consequence of swelling and often settles once the swelling disappears. During this time when your mouth opening is restricted you may have to modify your diet, eating soft foods. There are however no hard and fast rules about what you should eat. You must however keep your mouth as clean as possible to reduce the risk of infection using regular mouthwashes. Although there may be a little bleeding at the time of the procedure this usually stops very quickly and is unlikely to be a problem if the wound is stitched. Should the area bleed again when you get home this can usually be stopped by applying pressure over the area for at least 10 minutes with a rolled up damp handkerchief or swab. If the bleeding does not stop, please contact the department. Infection can be minimised by adopting scrupulous oral hygiene during the recovery phase. This usually encompasses normal tooth brushing with additional mouthwashes as advised plus the avoidance of smoking. Two nerves lie in close proximity to impacted wisdom teeth. The lingual nerve provides sensation In your tongue whilst the inferior alveolar nerve gives sensation to the lower lip and skin overlying the chin. These nerves may be bruised during tooth removal. A coronectomy technique reduces the chances of numbness to the lip and chin. If the nerves are bruised, you may either have either numbness or pins and needles in either the tongue, lower lip, skin over the chin or any combination of these. Most of the time it is temporary, although it can take up to 18 months to recover. On occasions it may not fully recover and patients may be left with patches of numbness. What type of anaesthetic is used? Local anaesthetic- this is an injection into the gum surrounding the wisdom tooth, rather similar to that you may have had at your dentist for a filling. The local anaesthetic takes a couple of minutes to numb the area and means that you will feel no pain during the procedure. Local anaesthetic and intravenous sedation- you can be given an injection into your arm in addition to a local anaesthetic injection into the gum. This makes you feel relaxed and less aware of the procedure. You are awake but patients frequently have little or no memory of the operation. General anaesthetic- it is possible to have a coronectomy under a “day case” general anaesthetic, ie although you are put to sleep completely you will be able to go home on the same day as surgery. Do I need to take any time off work? It may be necessary to take a few days off work and avoid strenuous exercise for this time. You will not be able to drive for 24 hours after intravenous sedation and for 48 hours after a general anaesthetic. Will I need another appointment? Further appointments are not always necessary but will be arranged if required. You will either be given a date when the procedure will be done when you attend the clinic or the Admissions Officer will send you a letter asking you to phone and agree a date and time that is convenient when the operation can be done. You will be sent further information on what you need to do and where you go on arrival. You will be able to discuss any questions that you may have with the Doctors in the oral and maxillofacial unit. After the operation, you will be given another information leaflet with advice on what to do and how to care for your mouth.